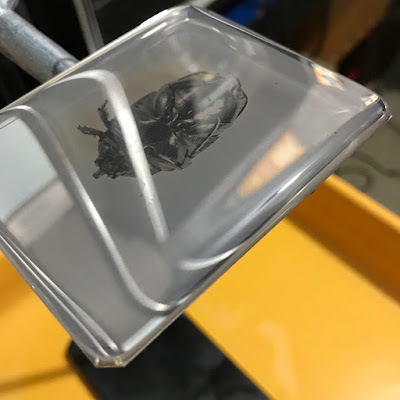 While cleaning and preparing Gilli-the-Bus for her fall adventure a few weeks ago, I found a June Bug belly up in one of dashboard crevasses and found the sight compelling enough to inspire a daguerrean close-up. After the trip there were a few things to do, so I couldn’t get to it until last weekend and so here’s a quick recount of how Mr. Beetle’s photo session went. Putty was used to adhere him to a white mat board and that was set up at about 25° angle for easier focusing. 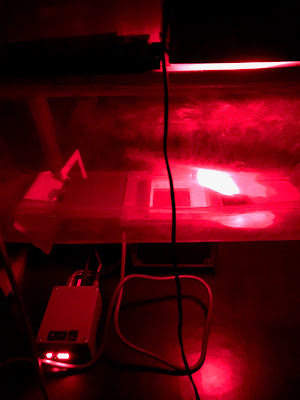 Two strobes illuminated the subject – one bare bulb with 3000ws behind it and another one with 4000ws being put through a strip box with both diffusers removed. One of the sharpest lenses I own, a Rodenstock Sironar 180mm 5.6, was selected and with that on a Zone VI camera bellows allowed me to focus on just about 1.5:1 macro ratio. In order to get almost all of his rather dimensional body in focus I had to use f16, so with bellows extended all the way I knew it would take a lot of artificial flash light to give the generally slow daguerreotype plate enough exposure (by the time I got to the exposure being how I wanted it I had to do 30(!) pops with those strobes). I chose 1/6 plate format because on it proportions of subject to plate size seemed most pleasing. 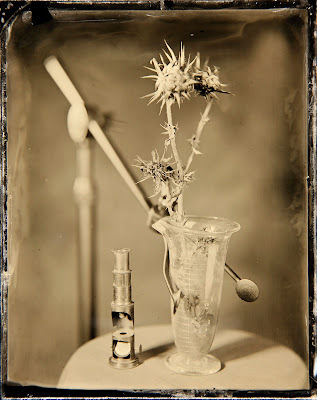 To see the exact composition, how it would translate with a blue-sensitive emulsion I often make a wet plate test image. 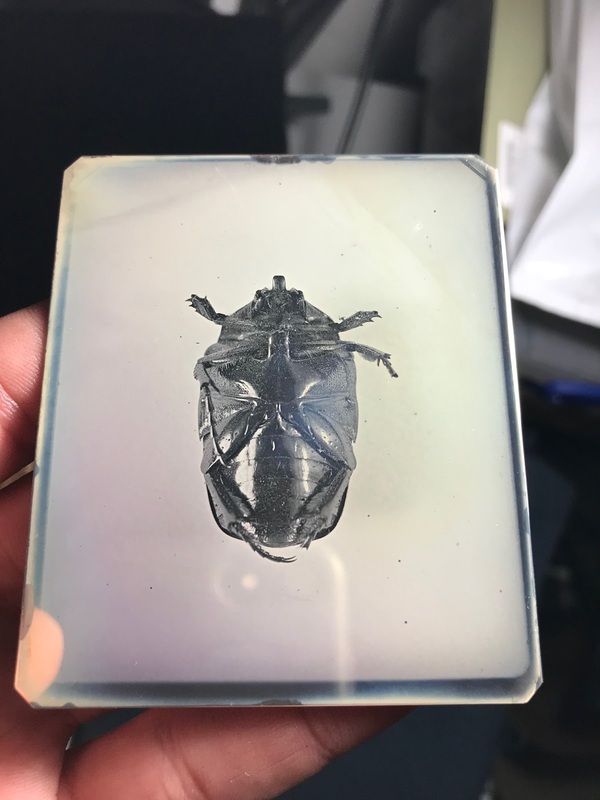 This also lets me know how much exposure I should give the daguerreotype since in my practice those seem to be about 3 stops slower than collodion (others have achieved faster speed, but they aren’t sharing their secrets…). 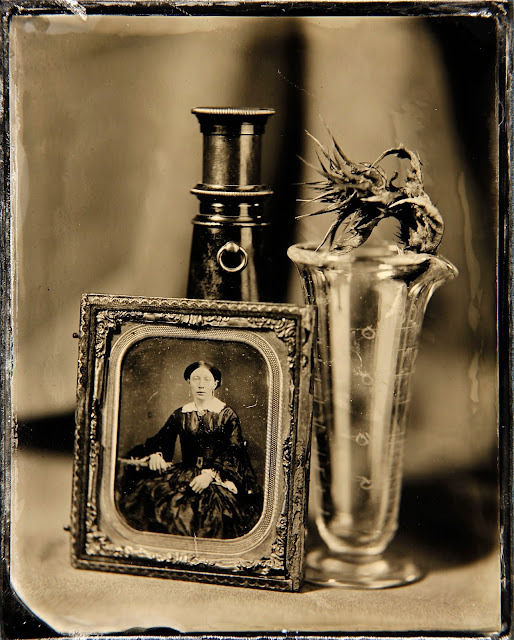 Here’s the 1/6 plate ambrotype test plate. I usually do collodion tests on glass since I can erase them and reuse the glass, but in this case the photo turned out rather well on the first try and I actually kept it and just varnished it prior to starting to write this entry. 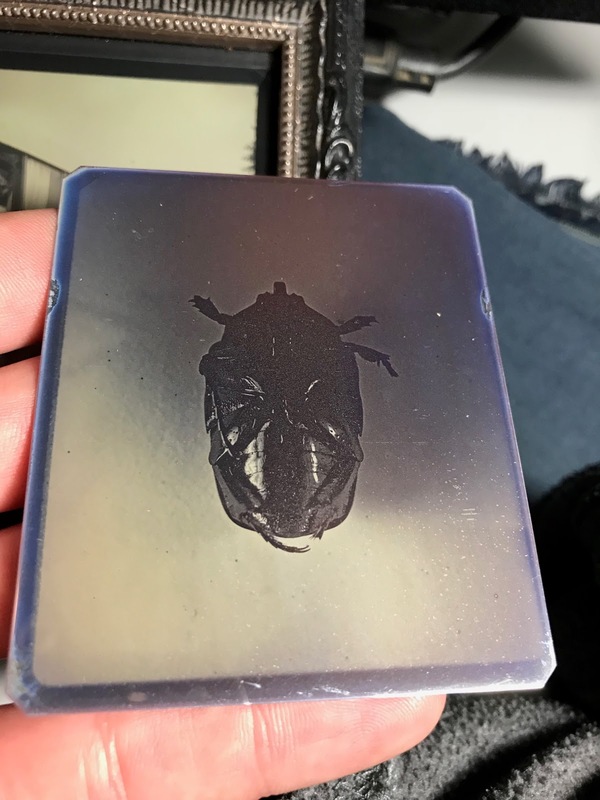 This one is actually made on dark green glass, which is really neat because when you look though it you pretty much get a green bug, which is what color Mr. Beetle is. 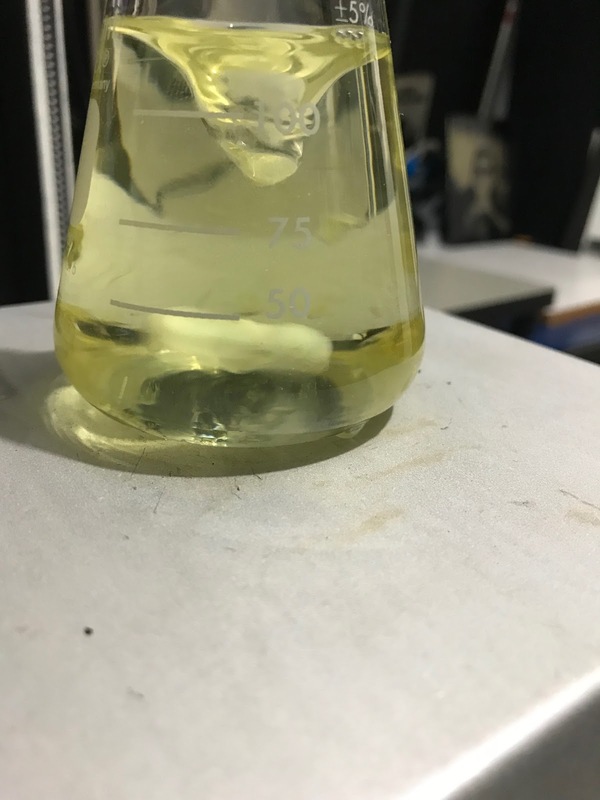 At this point I’d like take off on a little chemical tangent. 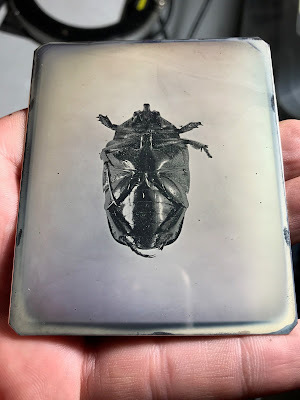 First I need to explain that I have made daguerreotypes relatively often and of sufficiently consistent quality, but only for about a period of about 7-8 months and at the point of June Bug shoot that was about 6 months in the past. After a break and with so little previous experience the machinations involved in creating a good plate do not come back very naturally. About a month prior someone asked me to make a portrait of them and after 3 tries we lost the light and got nothing good in return. My chemistry was acting really strange… One of the most crucial steps in making a daguerreotype is fuming the plate over iodine and then bromine and achieving just the right color. 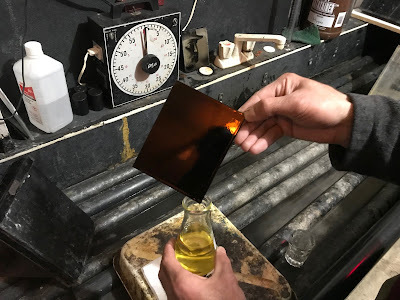 Progression of colors is usually taken through the yellow spectrum and just up to the pink in iodine and then into pink, rose and magenta with bromine (exact balance depends on personal preference of each photographer and most actually very carefully guard their fuming colors). Well, my iodine was working splendidly (35-40sec to deep gold), but no matter how long I kept the plate over bromine it didn’t change color (before the break I would get the results I want within 15sec on average). Between the failed attempt mentioned above and the session with Mr. Beetle I did have one more session during which I succeeded in making a very satisfactory plate of my neighbor Fred and it was then that I narrowed down my problems to old silica beads. 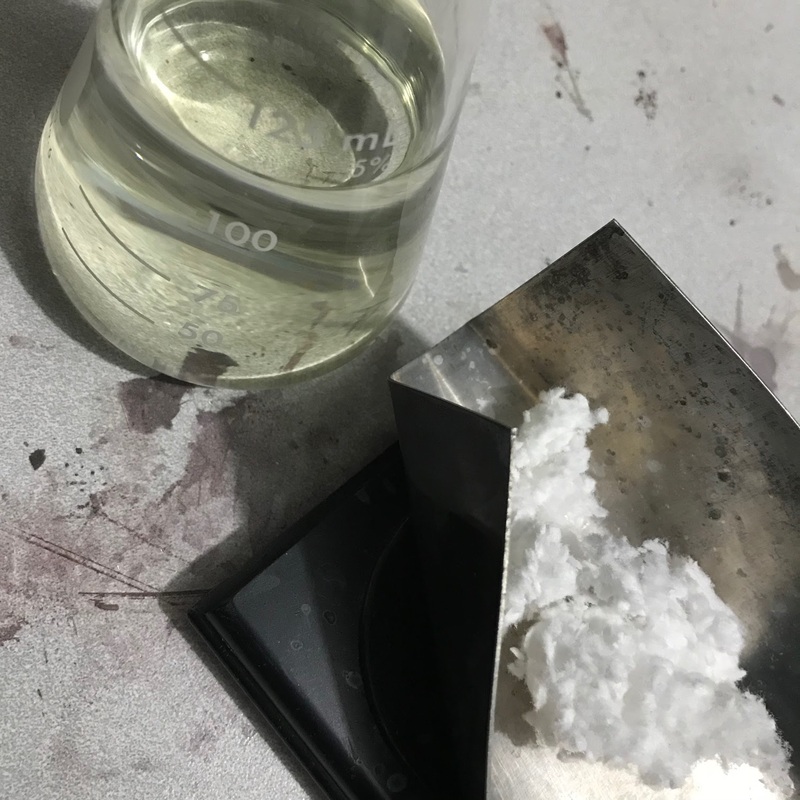 The way I use bromine is by putting 2-3 drops of it (100% pure, fuming, extra corrosive stuff) into a glass dish with half inch or so of silica at the bottom, silica beads absorb vast majority of those drops right away and then release the fumes slowly into the box. Well, apparently, over the course of just over a year, which is when a new bag of beads was open, silica absorbed too much moisture from the air and that interfered with its willingness to release the fumes. To remedy that I baked them in a toaster oven for a while and that seemed to have dried them out and helped a bit, but I’m still ordering new beads right now just to be on the safe side. 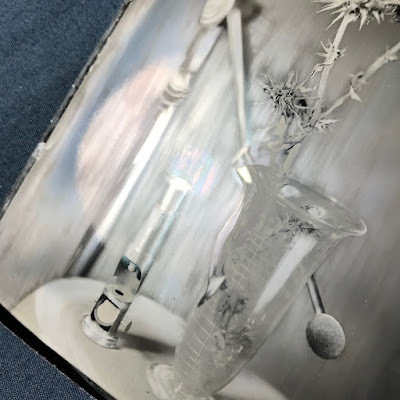 Luckily daguerreotype images can be buffed out a number of times and so the rather expensive silver plate can be reused until one gets the desired results. 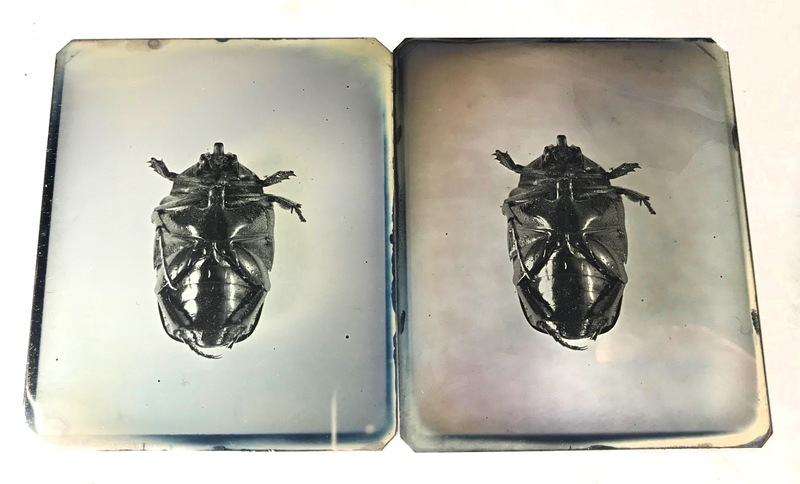 After I erased the image above the second fuming on that same plate went a lot better and more even, which gave me a good deal of hope. While it was developing in mercury fumes I was actually excited enough to take the following picture and text it to my friend Race Gentry, a local daguerreotype and wet plate worker, to lure him into coming over to hang out and watch me work. The fogging is minor and otherwise it was a pretty good plate. There’s a stain in top right corner and if it wasn’t for that stain I probably would have stopped there and lived with a little bit of fog, but after a bit of contemplation and internal struggle a decision was made to erase this one as well and try again. 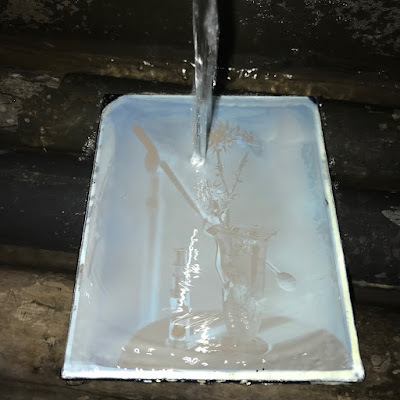 Third fuming again went haywire – colors were all striped and in my zeal to make bromine work it’s magic I actually overdid it, taking the plate into blue territory, which is something you don’t really want. 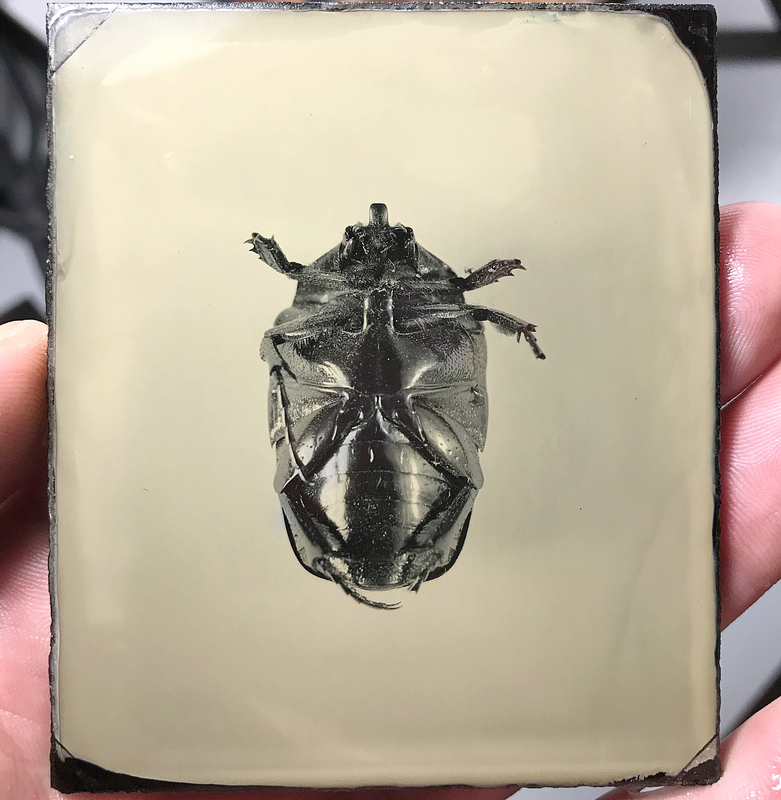 The result of my 3rd attempt wasn’t too bad – it would almost be interpreted as an artistic take on a daguerreotype theme, uneven and blotchy, but not to the point where it’s ugly. Image wasn’t too bad, but attempt #2 was better and so it made me wish I never erased it… I had to try it again. Race had to leave since by then it was getting close to 10pm, so I pressed onward on my own. Just in case things were on the downhill slope I decided to keep attempt #3 and make plate 4 on a different plate. 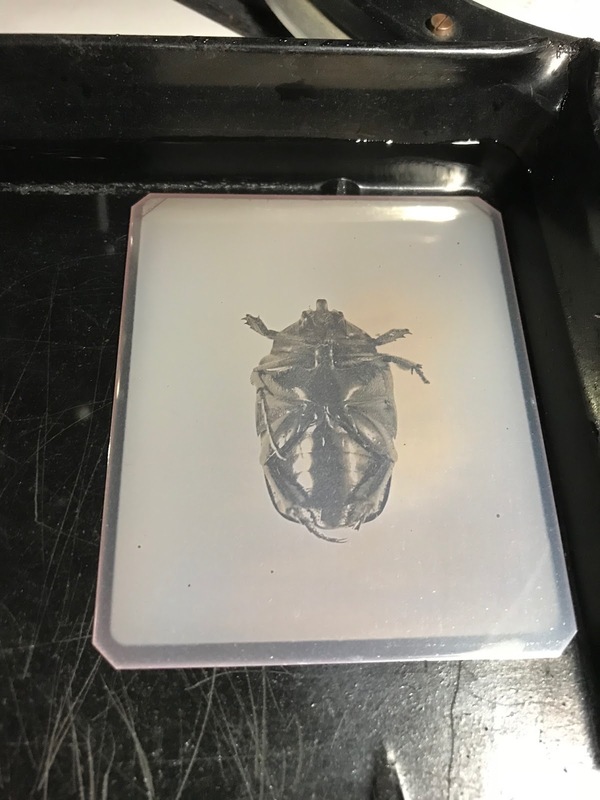 Maybe it was changing the plate or maybe it was the three previous attempts that made me polish better, but fuming went way better this time and after exposure and development I was rewarded with the following likeness. 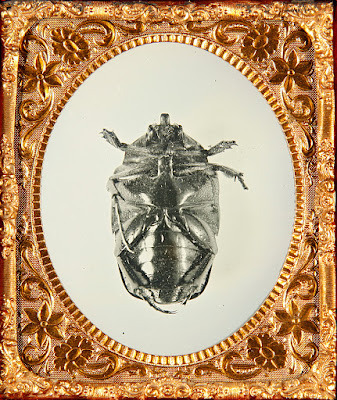 The picture above is of an un-gilded daguerreotype. It’s rather flat and lifeless as you can see. There it’s also still in the wash – an un-gilded image will brighten up a good bit, but it still won’t look anything close to as good as after gilding and I have gotten into the habit of not even drying them prior to gilding because it seems that the act of drying can itself bring on certain staining issues. Below the plate is shown on my gilding contraption with gold chloride on top of it being held on there via surface tension. I always find it fascinating how that miniature mound of liquid looks. After drying the plate I was overjoyed to see that a near perfect image was looking back at me from its surface. The image was bright, with good contrast and very minimal mercury accumulation in shadows, which is actually a perfect thing to see because that lets you know that development was carried up just a hair past perfect and the plate couldn’t have gotten any brighter without going way overboard and starting to see noticeable globs of mercury on there. Since I still had plate #3 I decided to compare them side by side and that made me realize that my mild content with the somewhat abstract quality of the previous image was misguided and that if I stopped there I would have regretted it. Take a look at plate 4 on the left and 3 next to it. 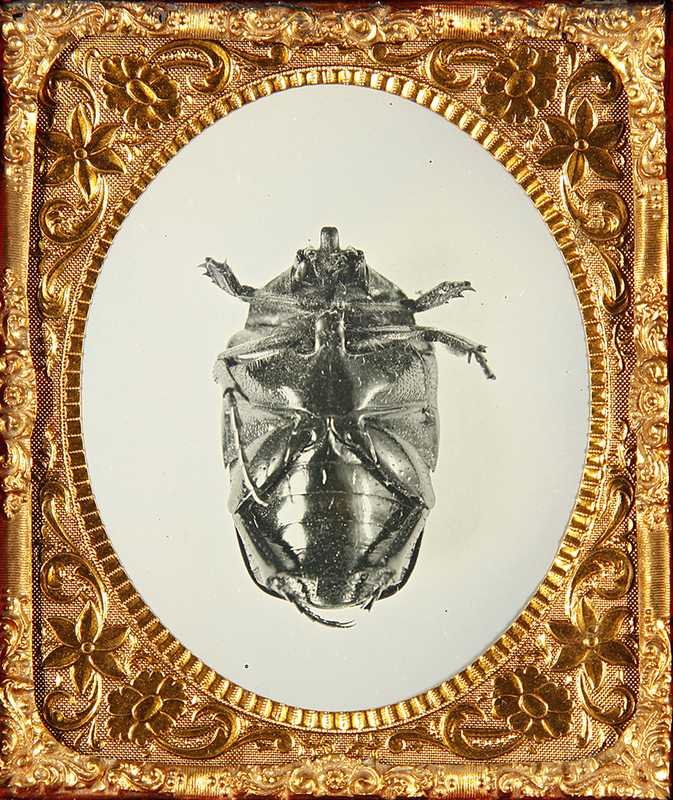 The next day I chose what I think is a very appropriate antique brass mat (I think the floral motif in it goes well with the life which Mr. Beetle must have lived), found a well-fitting preserver and sealed it up. Now, if protected from the most extreme of elements, it will last through centuries. To finish it up I dug into my stash of Michael Rhodes’ reproduction cases and so here’s the finished product (which, by the way is available for purchase just as well as the ambrotype test plate seen at the start of this entry – just shoot me an email if you’d like to discuss prices). First, I’d like to describe what I’m talking about for the audiences not familiar with Boris Grebenshikov and his band Aquarium. Boris Borisovich Grebenshikov (BG) started the Russian rock band Aquarium in 1972 and I can’t think of any other single individual who has contributed more to evolution of Russian rock than him. To top that off his lyrics and musical genre are spiritually elevated, thought-provoking and sometimes covertly politically progressive (after all BG started performing well before the fall of the Soviet Union and even now alternative points of view that differ from Kremlin’s line are not exactly freely tolerated). Those aspects of his music helped shape the minds of a generation to be more positive, inclusive and open. 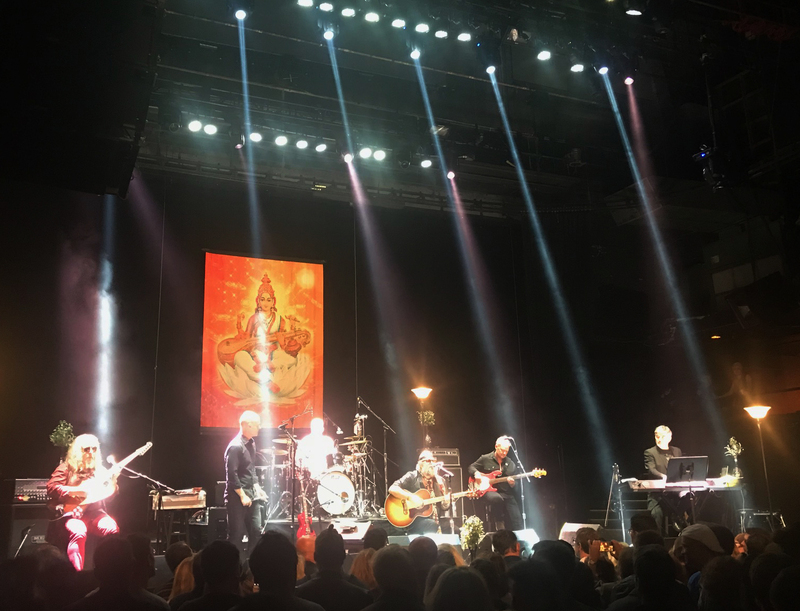 In short – in my view he is a god of Russian rock and I actually would recommend listening to his music even if you don’t understand Russian – it’s very soothing and melodic, it has a traditional Russian core with influences varying widely from reggae to Indian. 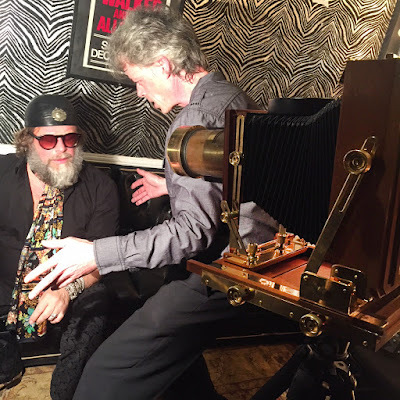 I started listening to his music at the age of 13 (just a year after starting my journey in the world of photography) and to this day I am thankful for the way that the light and love, which are palpable in his work, have played a role in my development as an individual. From those early days I harbored hopes of some day meeting him and shaking his hand. Those dreams seemed unobtainable as I was just a teenager when I left Russia and now that I’m in California it seemed that it would take a miracle to realize my desire as BG rarely comes to US and even much more rarely so to the West Coast. I did happen to see him twice in US – once in 2000 in San Diego CA and once in 2002 in Denver CO. After the Denver show I waited patiently for the band to exit the building, took a Polaroid picture of BG and asked him to sign it as well as the SX-70 camera with which I took the shot. I still have the actual image (I’ll try to upload it to this post later once I find it in the archives), but sadly the camera was stolen from my car during a break-in in 2004… if anyone sees a chrome and tan leather SX-70 for sale on ebay and on the bottom of it there are two distinctly Cyrillic letters (both B and G are rather different in Russian alphabet) written large in black Sharpie please let me know – I’d like to get that camera back…. But enough history – here’s how my dream came true in the most unbelievable way. Yesterday I was shooting a wedding in Los Angeles area (yes, sometimes I shoot weddings if asked to do so on film or in tintype form). A while ago through social media I saw the announcement of Aquarium playing a show in Hollywood on December 3rd and when I saw that some months ago I was distraught that it’s literally one day on which I had plans that could not be changed. Having to miss the first opportunity I had in 15 years to see BG weighed heavy on my mind, but what was there to do? I couldn’t ask the couple to reschedule their ceremony… I almost came to terms with not being able to go… Well, ALMOST is the key word there. At one of the short breaks what wedding photographers have while not much photo-worthy stuff is happening I logged onto Facebook and just for heck of it looked up BGs page (guess I wanted to shed a tear over the image of his tour poster). First link that came up during the search though was Boris’ personal account. Shocked to see is I sent a friend request and to my astonishment in about an hour when I had a chance to check my phone again I saw that he accepted my request. Empowered by that I wrote a concise message to him describing the depth of my awe toward his work and also the sorrow I felt for not being able to attend his show while being so close (oh, I forgot to mention – the wedding was literally 11 miles from concert venue). Even if I made it there I would still be arriving toward the end of the second set and there would be no way to even buy a ticket… I didn’t think that message would go anywhere, after all this was me writing to an internationally accredited rock star. I was shocked to find a brief reply stating that I would be added to the list of people to be let in! I almost fainted, but decided to take my bald pursuit one step further. As part of the package, the couple for whom I was shooting had me do 3 8x10 tintypes, so I had all my chemistry with me – to think that now I had faint opportunity to actually make a plate of my childhood idol was spine-tingling. I sent a few samples of my portrait work to BG I waited while my mind was lost somewhere in the clouds of dreamland. Not 20min later I got a message saying that the Road manager by the name of Peter was notified to let me backstage after the show and BG even gave me Peter’s cell number in case I had a hard time finding him. I really don’t know how I continued focusing on the ground glass of my Rolleiflex camera for the rest of the wedding or how I did not simply explode or caught fire when the cake cutting ceremony (the last shot I had to do) ran 42min late, but after the last frame was exposed I bolted out of there as if carried by 10 Winds and chased by 10 Arrows (sorry – an Aquarium song pun). 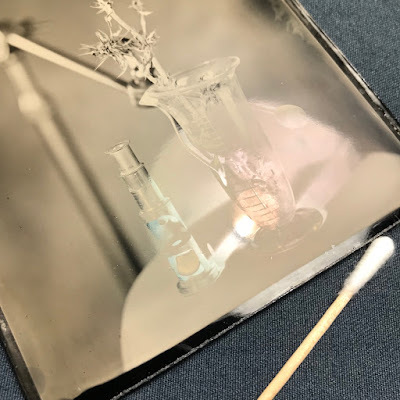 My Girlfriend assisted me during the wedding (there as a lot of equipment to carry – lights, stands, enormous 42in-wide dark box for developing 8x10 tintypes on location (it can actually do 11x14 and 8x20 as well), chemistry…. Thhus her help was very welcomed. Of course, she doesn’t speak Russian or knew how BG was, but I think I related most crucial facts on the ride to Hollywood and by the glow on my face she realized how big of a deal this was for me. We got to the venue about 9:45, about 15min before the end of second set. Thankfully Aquarium has a tradition of laying multiple songs for an encore, so there was another 20min or so of that too. 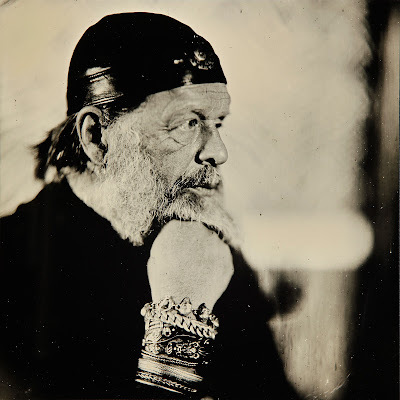 Simply to be in the audience of middle-age Russian rockers of hippie variety and listening to the heavenly sounds emanating from speakers was beyond satisfying, but to know in the back of my mind that after the show I had a green light to make a tintype of a man I’ve admired for close to 30 years was putting me in an entirely surreal state of mind. The music was perfect, everyone sang along to all the oldies and soaked up his new releases and the general vibe was one of peace and content. Here’s a photo of the show as it’s happening. As the show was nearing the end Jozlynn and I made our way to the side of the stage where an entrance to the back was visible. Behind the usual metal crowd barrier a few mellow Russians were chilling on a sofa, guarding the entrance was a large, but kind-looking, character in a white t-shirt that matched his long beard and who towered over me by at least half a head (and I’m not short). I asked if he happen to know where Peter the road manager was to be found and was delighted to hear that indeed the man standing in front of me was Peter himself. After pulling up the conversation where I was given his number by Boris I was, in a very cordial and kind manner, granted a promise of being able to come backstage after the show. When the encore wrapped up Jozlynn and I ran outside to the car and picked up all the gear we could handle in one trip – dark box monster, lights and stands, camera and tripod – and headed back in to work our way through the crowd toward backstage entrance. There we again encountered Peter who was busy fielding questions of all kinds from excited and somewhat inebriated audience members. Peter told me to go research the dressing room while leaving my photo wares behind and see where I could set up. Jozlynn was left to guard the equipment and I descended a narrow stairway toward my dream. Downstairs I found a very calm and relaxing scene with band members and some tour folks mingling with local friends or new acquaintances. There were two dressing rooms – one was nearly empty (and therefore I chose it as the place to set up for the shoot) and the other contained the green room spread with more alcohol than solid food. I used to shoot for a local guitar company, so I’ve been backstage often before, but I’ve never felt so welcomed by every gaze as there. To my shock, before I could even say something, one of the original band members turned to me and said ‘you must be Anton’. I lost my speech for a few seconds, but then managed to made some joke about being Anton if I must. Way in the back of the narrow room I saw Boris taking a shot of some clear liquid while talking (in very good English) to a local music producer. After a brief and friendly ‘hello’ I planted myself for a while in front of the table and just soaked up reality of what I was witnessing. Actually, I don’t want to divulge any of the contents of the conversation I overheard or the name of the producer he was talking to as those may or may not be ready for public consumption, but let me just say I pretty much felt that I was witnessing history in the making. Boris turned to me a few times and made sure that I was aware that he knows I’m there and is just waiting to wrap up the conversation before he’s ready for his likeness to be tintyped. 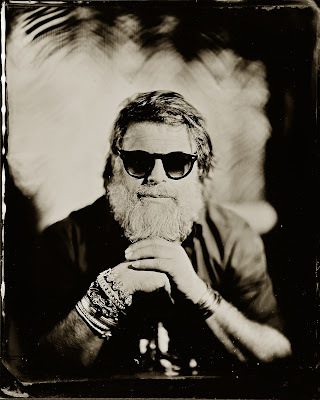 I related to him a few of the nuances of wet plate collodion photography, manly that it takes a while not only to set up, but also to actually make an image happen, and said that I’ll go set up and come get him when ready. Back upstairs Jozlynn was getting a bit anxious - I’m sure everyone around was assuming she was Russian or at least spoke the language. She helped me carry what we had downstairs, I set up all I could and then ran back to the car for my chemistry cooler. 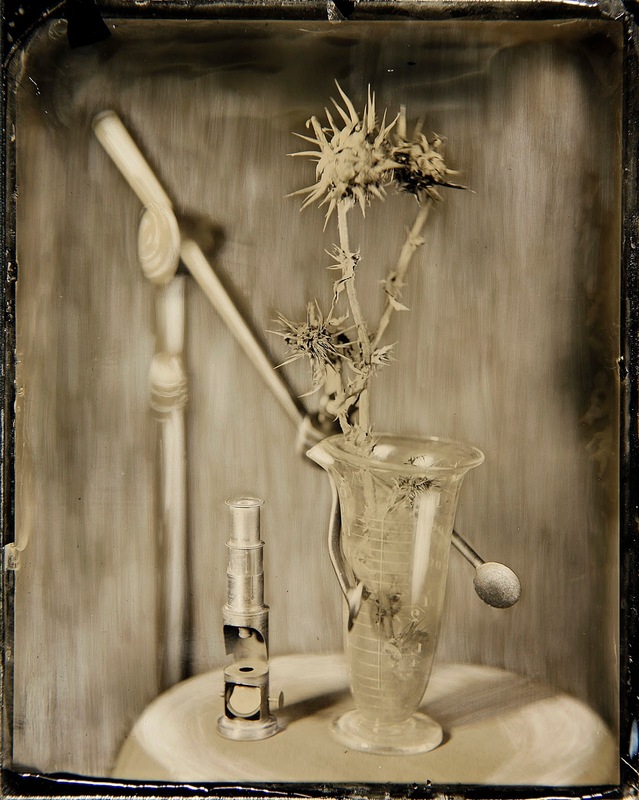 I don’t think I’ve ever before moved so fast while setting up a collodion gig. Plus, the adrenalin level was at its peak due to the subject about to be captured. By the time things were where they belonged, dipped a plate in silver and managed to coral the star toward the set I was sweating like in a sauna and so here’s a photo taken by the above-mentioned producer of yours truly relating to Boris Grebenshikov the posing I had in mind. Oh, I best mention something really quickly before you see the two images below – my 8x10 silver batch was a bit on the dirty side… Wedding tintypes came out great and clean, but I guess some sediment got freshly stirred before I did the plate or my dreams and so there’s a bit more spotting and comets than I like to see in my usual work. Nevertheless – here’s there first plate. I actually cropped from 8x10 to a 7.5in square after it dried – I think it looks a lot better this way. After seeing it though I got a strong feeling that I could do better if given a second try (after all that first one was pretty much a test plate as far as light output and positioning), so I asked Boris if I can have 10 more minutes of his time and he seemed happy to provide me with that. 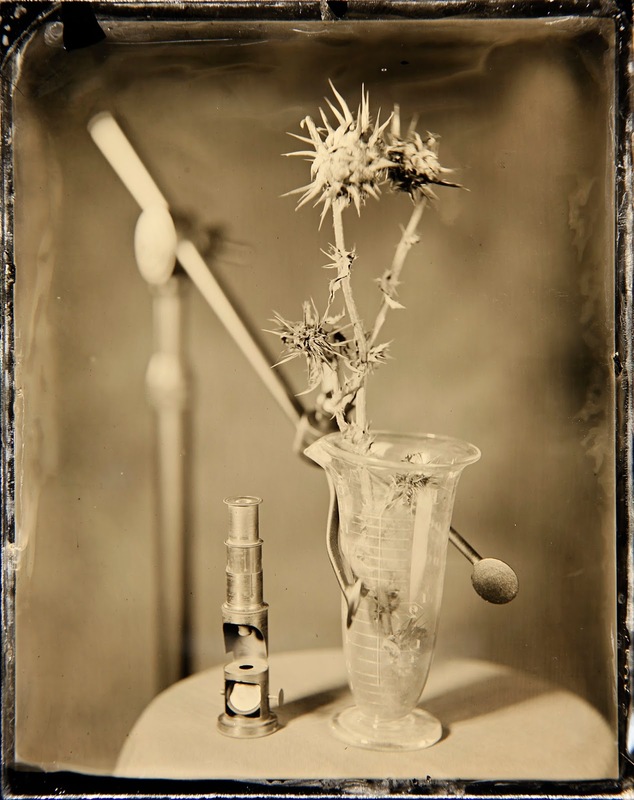 And so this second 8x10 plate was prepped, exposed and fixed in front of him. By the time Jozlynn and I got done washing the plates, cleaning up and folding all the gear we were literally the last two people inside the entire venue not including the night security guard who escorted us outside through the dark and empty floor where just hours ago hundreds of loyal Aquarium fans were blissfully dancing to the music of their youth. It took us an hour and a half to drive home. Even though it was almost 3am by then and I’ve been up since 8 I still had to drink a glass of wine to calm down and be able to sleep. In conclusion, I would like to thank Boris Grebenshikov for his kindness and generosity and for making my life-long dream come true in such a spectacular manner. I would also like to say that this was likely as ideal of a rock star meeting as any fan can have – Boris was even more ‘real’ and ‘human’ than I could have ever imagined. 45 years of rocking hard did not chafe or harden him and in his warm and enveloping smile one could see bright light and deep personal love.